When state lawmakers approved the original 2010 gaming compact with the Seminole Tribe, they promised Florida residents it would serve as a firewall against the further expansion of gambling. The proposed renewal of the compact is a complete violation of that trust. 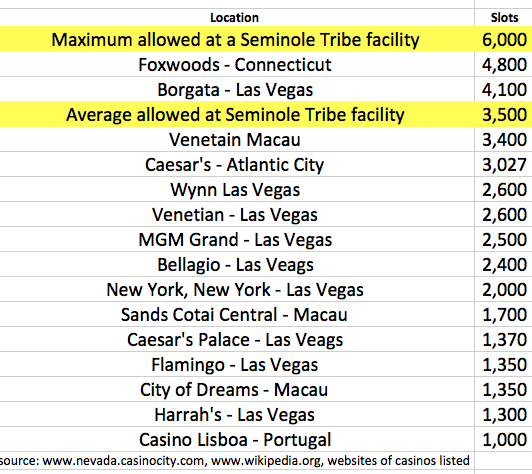 As negotiated, the compact would allow one or more tribal facilities to have the most slot machines in the world. The compact allows for an average of 3,500 slot machines at the seven tribal facilities, with a so-called “cap” of 6,000 machines at any one facility. By comparison, the largest casino in the world by gambling square footage is the Venetian Macau which has 3,400 slot machines. Foxwoods casino in Connecticut reports to have 4,800 slot machines on their website. “Allowing the Tribe to have the most slot machines in the world is not a ‘cap’, it is a giveaway that makes the tribe the ‘slots king of the world’,” said John Sowinski, President of No Casinos.